I really enjoy putting Izzy in the stroller for a run, walk or when we go to an outside shopping area. Izzy’s good on her feet, but there are so many cars and people at outside shopping area that I get nervous. Not to mention sometimes her mind thinks she is quicker than her feet and she falls. If you haven’t noticed on and off in photos she gets a boo boo on her knee more often than I’d like. On top of it all, sometimes it is nice to have free arms for just a few minutes...am I right? She hasn’t always been the biggest stroller fan, in fact this is the best she has ever been in a stroller. I like to think because I run 3-5 days a week with her in the stroller this has really helped her tremendously. I’m obsessed with organization and having a “place” for everything! My friends joke that I’m that mom that always has EVERYTHING. It’s true I like to be prepared for any situation with Izzy. 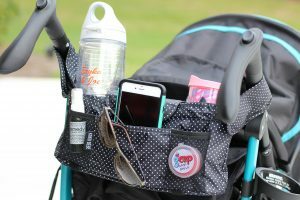 This is why I’m loving my new KOKO BÉBÉ Molly stroller organizer. I can find a space for keys, my phone, drinks, a diaper and wipes… the list goes on! This is a chic way to organize your stroller must haves or things you like to have at your finger tips. Like I said, we have a lot of must haves because I always like to be prepared. You can find this organizer here. There are two must haves for the stroller organizer I’m going to share with you. You should always have at least 1 diaper handy, you just never know! I wish I knew sooner about the Bambo Nature diapers because they are seriously the softest diapers EVER! If you want to know more reasons why I love and suggest them you can read more here. The GCAP is a spill proof stretchable cap for your child! If you forgot your kids cup. Go grab a water bottle. The GCAP cover stretches to cover the top of the bottle. Be sure to snag or pack a straw (I like reusable ones) and you are good to go. You can use these to cover more than a water bottle, but you get the idea. Remedy Oils germ buster spray. I love this spray because it’s 100% pure and extracted by non toxic methods. The oils are also wild harvested or organically grown whenever possible. Germs are all around so it’s nice to clean Izzy’s hands and then not worry about her putting her hands in her mouth. Go grab yours here. 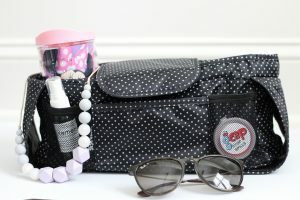 Ready, set… go organize your stroller and check out my must haves listed above! For a chance to win this stroller organizer enter here. This is the cutest organizer!! If I had a stroller I would definitely use this! Organization is key when you have little ones needing things ASAP. Ha sounds like me! Yes it’s a hassle to dig in the bottom basket all the time. I loved reading this!!! LOVE the organization tips, as well!!! love these pics! and we love ours too!!! 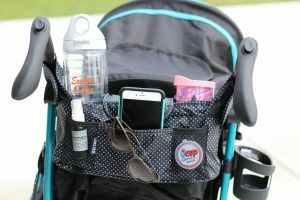 Love the stroller organizer and the germ spray! 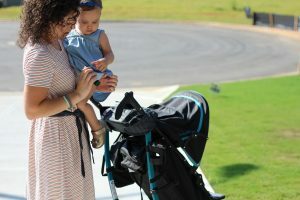 The stroller organizer is the perfect solution so you don’t have to lug the big diaper bag around. The only other thing I would add to the stroller organizer is snacks for the little one to keep them entertained while being “contained” in the stroller.? Oh yes we have snacks in the organizer always ?? I would love to win this! Is exactly what I’ve been looking for! I love having a secure space for a good sized water bottle and my wallet and this looks like it would be perfect!! Love reading your blog!!! And we take stroller rides everyday one of my baby girls favorite things!!!! And you know what that means lol that means I have to make sure I have alllllll the things she would need during the stroller trip….. And thank God for the stroller organizer which is big enough to fit all the things my baby and I would need And The stroller organizer is the perfect solution so you don’t have to lug the big diaper bag around. Thank you so much for the chance to win the giveaway!!!! Hope I win ? But still wish luck to everyone else!!!!!! Thank you for reading my blog and entering! 3 are being giveaway so odds are a lot better than most giveaways! It’s so hard to bring the whole diaper bag I agree with that! Good luck! 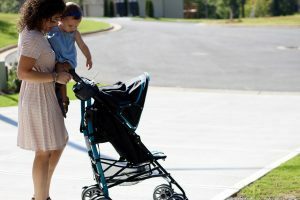 Love the stroller oraganizer, great for storing your keys and wallet. I love that it has a secure place for them. My first baby is due in a month so I don’t use a stroller yet but this is definitely something I would use and want. I need my water bottle, keys, phone, chapstick handy always. Yes you will definitely need a stroller organizer. Congrats on the new baby & good luck! My first baby is due in a month so I haven’t used a stroller yet but this is definitely something I would want and need and as I’m a very organized person and love cute ways to do that. I know I would always want my water bottle, phone and ChapStick handy and can imagine having a bottle, snacks, and toy for baby. Would love to win, thanks for the opportunity! I love the organizer! Its actually cute, unlike most I’ve seen! Right? Thank you, I thought the same! It’s so stylish looking. I’d definitely love to have this because my little one is due in February and I love walking! This will be perfect to carry everything when I take my little babe out for a daily walk! Yes a stroller organizer is a must have, good luck! And congrats on your baby! I love this! We walk every morning, 4 miles! I always bring tea, garage door opener, pepper spray, phone, toys, sunscreen! We have to be prepared 😛 This would be great!! Oh yes, prepared for it all! Ha! Good luck on the giveaway! I like to put my drink, phone, car keys, his sunglasses, extra binkies, wipes, and coupons I need for that day??? he’s only five months so I’m sure I’ll need more stuff soon! ? Love that organizer! It is so cute! I always have water, toys, a pacifier and diapers/wipes with me when we go out! Toys are definitely a must to keep littles entertained! Love and so need this stroller organizer!!! I always take a water bottle for myself, soppy for my babe, my phone, paci, snack for my baby, diaper and wipes ?? what a cute little organizer!! i need one like this bad!! Thanks for this awesome chance to win some cool stuff! I just received my first package of Bambo Nature diapers in the mail today! So I’m excited to try them! And as far as our stroller goes, we love The Honest Company Spray Lavender Sanitizer. It works great and smells amazing! We keep a trial pack of Honest Wipes in there as well. We are currently experiencing teething, so our go to product is Hylands Teething Tablets. They are little miracle workers! A pacifier clip, with our little guy’s favorite Avent Soothie paci, and his little elephant taggie/cuddle buddy! So many great goodies! We love our Bambo nature diapers, I think you will too! Thank you for entering & good luck! Omg! I seriously need this in my life. I hate to carry my big diaper bag. I always want something small. I love to carry sun screen, diaper, wipes, sippy cup, my pepper spray (never know), my keys, and my phone. You are definitely a super organized mama! I need to take after you more. Thank you, I’m trying. It’s the only way I stay sane! Ha! I love this and so could use it! I have to have my yeti, or a water bottle, phone and diaper bag of course!! This is so needed on my stroller! My cup holder fell off and this would be perfect for that plus holding snacks and my phone. This is the cutest organizer I’ve seen yet! I love the polka dots! These organizers are so important with strollers, I actually don’t have one for my single stroller and it kills me not to have a place to put my coffee/water when we are out and about. It’s time you get one! I agree it really is adorable! I would love this organizer. When we use our jogging stroller to take walks, I always grab my keys, something to drink for myself & my daughter, my cell (since I have to take pics along the way normally once she falls asleep). I also bring a diaper & wipes along. I have an extra jogging stroller we keep in our car for when we are on the go & I almost always shove the diaper bag in the bottom then. It would be so nice to have an organizer so items wouldn’t get dirty in the bottom when we are out taking a walk. Love the blog! !